Old year: Burning the rotten beams before the man from Hysterical Scotland comes back. Well, all right, we saved one or two of the most-hatcheted. Didn't want to mention the fact that the internal framing of some of the house is (still) made from old sailing ship spars. New year: stormy weather on the way. Though that, it must be said, was this morning when I was out for a walk, and everything's gone suspiciously calm. Either we're about to get hammered or the big winds have headed sooth to disrupt the city centre celebrations. At any rate, folks, here comes 2007. See you there. Have fun. Oh, and by the way, we did save the best of the adze-marked beams. We're parcelling them up and getting ready to post them to Edinburgh. - CATS generally - raising a million quid in less than a year for Shetland's CAT scanner is superb. 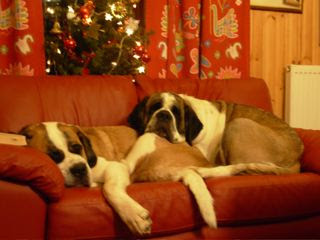 Nigella (and that's Lucy the St Bernard, not Nigella. She's watching Quoyle the labrador have his annual dip) loomed large over our Christmas foodstuffing. Several recipes were downloaded and printed out, and there were parsnips, there was goosefat (frozen since last year's goose, in fact) and other such delights (including pomegranate cous-cous). Bed, eventually, after the hilarious crashing noises involved in trying to put together a full drumkit in Martha's specially-cleared bedroom while she pretended to be asleep. Susan handled the rest of the Santactivity, which I thought was only fair. As I write, on Boxing Night, Martha has progressed further in drumming technique than I have in 40 years of hanging around with percussionistas, lugging their drums up dale and down hill and soundchecking their tom-toms and snares while they avail themselves of backstage hospitality. Boom-chicka-boom-boom-chicka, and if you will, boom. Amazingly, everything worked - James's computer, Magnus's iPod, Martha's drumkit. Susan and I were delighted with our various presents (By a sheer fluke, I got Susan a restored treadle-driven Singer sewing machine complete with every single 80-year old extra, up to and including an instruction manual). The food was great. The afternoon was a riot of music-making, thanks to the arrival of Hazel, her mum Winnie, her aunt Lilian and Hazel's Uncle Dwight, from Burma via Manchester. Dwight turned out to be not just a doctor and an inveterate collector of guitars, but a master of the piano, the mandolin and guitar. So some post-prandial rockin' and rollin' ensued. After that, it was time to slump before a recording of The Hogfather Part One, the stunning film version of Terry Pratchett's book. We've just watched Part Two, and frankly I think it's the best new-for-Christmas show I've seen in decades. It was truly magical. No excuse, apart from general coma, for watching the Vicar of Dibley. It was pants. Shame on you, BBC. And let's not even mention the disgraceful Jam and Jerusalem Christmas 'Special'. Rushmore popped up on Five, completing my Wes Anderson experience - it was awesome - never seen it before. And great to hear a real Scots accent in a Hollywood film, courtesy of Stephen McCole. Who would believe he was Moose Heidegger in Band of Brothers? Anyway, managed to go groggily for a walk today. 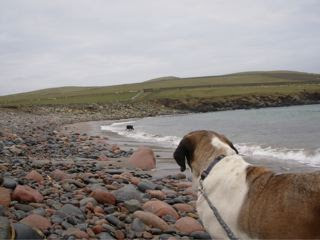 Loads of seals popping their heads out of the water at The West Ayre. The weather is peculiarly mild. In fact, it would be mild for June.I fear a foul February! To the cold turkey! 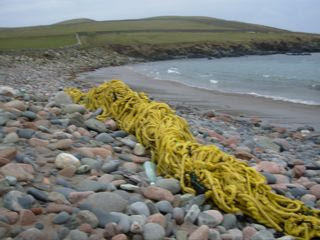 Oh, and that creepy large yellow monster on the beach is, believe it or not, hundreds of fathoms of rope, probably dumped deliberately from a fishing boat. ...and the preparations are just about done. Susan's away to visit her mother in the care centre. Tragically, Audrey's just not fit to come home for Christmas dinner this year, and it's the end of an era. Scott was just here with a card and tremendous news from the Sullom Voe oil terminal, just down the road - a massive renovation and reconstruction programme starting in the summer, and another 20 years of operation. It means that there will be a great deal of secure employment in this part of Shetland for the foreseeable future. And I'm not going to get into the ethical and environmental issues inherent in having Europe's biggest oil terminal on the doorstep. Hey, it's Christmas! And with the sea just 20 feet from our front door (one foot above sea level) we're at the cutting edge of global warming in the Neck of the Bog. We can always move upstairs. 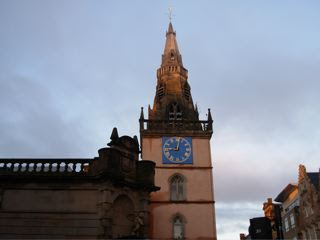 To the Radiocroft under cover of twilight to pick up Martha's drumkit and a large-print Bible so I can read one of the lessons at tonight's Watchnight service in the kirk...that will be weird. I haven't read the Bible in public since my days as a practising rock'n'roll evangelist. As for the large print...can't be arsed with wearing glasses. Vanity, saith the preacher, all is vanity. And so things wind down towards tomorrow's splurge of giving, receiving, eating and drinking. We're going out to a neighbour's hoose for some pre-kirk canapes, then, after midnight, with the bairns in bed, Santa will arrive. The youngest child in this house is a cynical 12, but still there will be mince pies and whisky laid out for Saint Nick, and a carrot for Rudolph. By tomorrow morning, all that will be left is half a carrot, marked with clear signs of reindeer-gnawing. May you and yours have a happy time. Merry Christmas. Last day at work before slumping into the Christmas sofa...work? Call that work? Well, I call it work. Home, cook the tea, try to make Garageband work on the Mac. Very nearly succeed. Resolve to try again. Have glass of wine and resolve not to. Interesting observation from Gerry, one of Susan's oldest friends. Why do people fae sooth, like us, come to live in Shetland? Because, he says, they see it as a blank canvas where they can come and repaint the picture of their ife. Or, a clean sheet of paper where they can rewrite their story. It is, he says, a strange and magical place, and there's no doubt that's true. I came here, undoubtedly, to reinvent myself. Or find myself. Actually, I came here to default on a a mortgage on a flat in Summerston, which then mysteriously sold, I sometimes think to an anonymous friend...oh, and to escape the violent threatenings of various aggrieved Glaswegians. And, err...to reinvent myself. And because Foula lamb is the best food I have ever tasted. Sadly, or perhaps more or less happily, the reinvention failed. No matter where you go, no matter how glorious the Lang Ayre or Tingon or Muckle Roe, how splendid the music or the home brew, it's still you. Or for that matter, me. And now I'm here, I feel myself settling, not in or down. Just settling, like a sinking building, or a grounded ship. Who would seriously want to be anywhere else? Exciting times on the Bookcroft front. After closing Britain's Most Northerly Second-hand Bookshop in September, following a reasonably successful summer season, I moved The Radiocroft broadcasting operation into one of the main bookshop areas. Now people have been asking when the shop is opening again, and COPE, a local social enterprise company has asked me if The Bookcroft could deal with the used books donated to the COPE scrapstore. This looks like being a continuing relationship, with benefits both financial and logistical for both COPE and the Bookcroft. Watch this space! Only problem is handling the inevitable Reader's Digest condensed books that are donated to charity shops and scrapstores by the tonne. Why did they ever exist? Nine o'clock on Saturday morning, and I'm Glasgow's Trongate, waiting for Drum Central to open. Thus began a hell-for-leather day of shopping, visiting, eating and attempting to pack an ever-increasing amount of stuff into a Renault Kangoo van. All of this culminated at IKEA with a gut-wrenching moment when Magnus and I thought the red sofa (plucked from the Bargain Corner) was not going to fit. But it did, and so we now have a couch once again in the kitchen. The St Bernards lost no time in taking possession of it. Ah well. Phew! 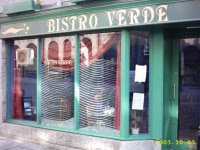 Safely in Glasgow, after last night's BBC Music Department (Popular Rock And Accordion Dept, Aberdeen HQ)party at Bistro Verde on the Green, one of my favourite Castle Greyskull eateries. Truly fantastic food, though the chilli prawns almost blew the top of my head off. Alas, I had to behave in a fairly abstemious manner, as I was facing an early morning drive to The Dear (Mostly just expensive these days) Green Place in the van I've hired to transport some goods on Santa's behalf. Notably a drumkit. Still I did allow myself one vodka shot to finish the night off in Siberia, one of Belmont Street's trendier howffs. People did look askance at my Primark suit, but hey, an Armani hoodie's pretty much like a North Eastern Farmers one, except more prone to staining when showered with sheep excrement. As seems to happen quite a lot in Belmont Street. Phoning today to check how it all ended up, I discovered that the promised VIP access to something called Club Tropicana failed to materialise, as it was, well, shut. Still, the Youngsters of the music team were out partying until 5.00am, which you wouldn't have thought was even possible in Greyskull. Possibly they were in the Independent State of Torry. Where anything's possible. Or even probable. I'm in the rapidly decaying BBC HQ at Queen Margaret Drive, where tonight the very last BBC Christmas party will take place before the move to Pacific Quay. I have fairly lurid memories of the old Film Unit parties back in the day, and wish to leave them intact, so will not be attending. I will however, be heading for The Halt Bar in Woodlands Road, there to rawk'n'roooaall with the excellent Ping Pong Banana Show, who are a band, in case you were wondering. ...Good grief, that was a bad one. Twelve hours of violent pitching, rolling, slamming, crunching and clanging on the way from Lerwick to Aberdeen aboard the good ship Hjaltland. It could have been a lot worse, and frankly, I expected it to be, what with all the warnings about taking care when moving about, switching off car alarms, the likelihood of 'discomfort' and the captain announcing that he didn't expect as to arrive in Aberdeen before '10 or 11'. But the wind came around and moderated (which didn't affect the turbulent state of the sea) and we were in Castle Greyskull by 7.00 am. I slept (courtesy of the trusty Phenergan) from 7.00 pm until 9.00pm, when the movement of the ship woke me up. Then from midnight until 6.00 am. Anyway, the trip was made (only just) bearable by the eye-wateringly pungent sounds of Acoustic Ladyland, second only to The Hold Steady in my musical discoveries of the year. Skinny Grin is an apocalypse of an album: Swaggering, brutal urban English jazz as filtered through Hendrix and Chas'n'Dave, and a tremendous antidote to all that singer-songwritery whining I normally listen to (and love). Not a good forecast for tonight's sailing to Aberdeen. Force seven, eight and occasionally nine, eight metre seas...and there's no chickening out. I am Seasick Santa, ready to head south on a mission to IKEA, Drum Central, Sainsbury's and to extract son Magnus from his student enclave, Yule celebrations for the purpose of. To which end, I've just hired a Renault Kangoo van. I would have taken the horrid Maverick south, but a combination of the EvilBay seller not sending the DVLA his bit of the registration document, and my losing the wee green piece, has left it off-road and untaxed. Huh. The week promises to be hectic: Sunday Herald Diary to write, Music Dept (Aberdeen HQ) Christmas party on Thursday, Ping Pong Banana Show (it's a band) gig on Friday, various family visitations, IKEA, that drumkit, shopping and more shopping, then boat back on Sunday. Phew! Oh, and a few radio shows. "No such thing as bad weather," goes the Russian proverb (well, according to Mike Skinner it does)"only bad clothes." I beg to differ. There are no clothes extant capable of making bearable some of the climactic conditions pertaining to Shetland over the past weeks. As I write it is 12.40 pm, and 40 minutes ago, it was dark. It's now a murky sort of daylight, but not pleasant. And wet. Wetter than wet. So soggy is it that there are fears (see above photo)that the Ness of Hillswick, including our house, could end up being cut off from the rest of the People's Republic of Northmavine. On one side of the road is the sea. On the other is a salt marsh/dainage bog, connected to the sea by a large pipe that runs underneath the road. As you can see, the water is overwhelming the salt marsh AND the pipe. Given that the road (and for that matter, the bit our house is built on) is reclaimed land, you can understand our concerns. Global warming? Sea level rise? Welcome to the cutting edge, mate! I've been with the Bank of Scotland (Shetland outpost) ever since moving to the Neck of the Bog (for the first time - in 1987) and the Byres Road branch (Glasgow) of the Royal Bank bounced a cheque I'd made payable to a Lerwick clothes shop. In a small community like this, bounced cheques are embarrassing, and as it had happened simply because of bad communication, I decided to move all my monetary assets, or debts, rather, to the Lerwick bank my wife used. All went well, really, for years. I went through all of the Bank of Scotland's technological advances with it, including HOBS (the Home and Office Banking System - hard to believe, but in the era of the Amstrad PCW8256 you needed to buy a separate miniature computer terminal just to do your banking remotely). We obtained mortgages and insurance from the Bank. Good relations were established and maintained with the Lerwick branch. And even nationally, I was asked to address a major Edinburgh Bank of Scotland Christmas dinner. Just before the Halifax merger. Since then, the bank has slid inexorably towards what seems like a centralised, callous disregard for personal customers. You can no longer communicate directly with the branch (unless you have secret mobile numbers for the very nice people who still work there). Payments on Switch have been turned down for no good reason (once leaving me stranded in Kilmarnock; say no more); cash can go astray, pay-ins take far too long to clear, and still the charges for cheques and withdrawals are applied, brutally. Yesterday, having lost my chequebook, I tried to have the remaining cheques stopped, find out whether anyone had been using it without my permission, and get an account balance. I was treated with what appeared to be aggrieved unhelpfulness, despite having access to a 'Private Banking' personal contact called Morag, who was not around, alas. So I ended up talking to an electronic answering system and then a series of women in what sounded like Morningside. 'You could be anyone' said one. "I can't give you any information'. 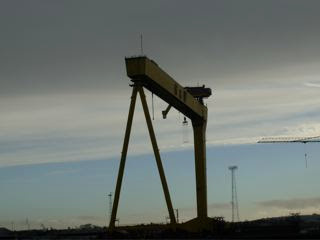 All kinds of problems loading pictures to this blog, so the best thing to do is click on the TITLE of this post, and you will be taken to my FLICKR page of Belfast pictures. First, I'd thoroughly recommend the City Sightseeing open-top bus tours. It's a tenner for an hour and quarter, but you can hop on and off as and when you wish, and this is like no other tour on earth. First, the guide on our bus was funnier than 90 per cent of all known standup comedians; secondly, it's a no-pussyfooting, political, sociological and historical voyage, taking in the poverty, the idiocy and the sheer strangeness of the Shankhill and the Falls, as well as the amazing transformation currently taking place in Belfast's fortunes. This is a boom city, going crazy on construction and renovation, and, to be blunt, money and drink. It's like VE night every night. I thought I was used to hard public drinking (Shetland and Glasgow) but this is on a completely different scale. And I'm not just talking stag and hen parties (that's a market just beginning to take off, thanks to the 400-plus bars). It's a local phenomenon. Having said that, Belfast is one of the friendliest cities on earth, the people are generally fantastic, and culturally, there's an enormous amount happening, as illustrated by the superb performances of Brian Houston and Duke Special on my show. The media, though, from newspapers to what I saw of local TV, appears to be in a timewarp, straining unsuccessfully to keep up with the speed of cultural, social, economic and political change. Though as you watch the posturing of the hidebound, tribal parties who will, I suppose 'power share' eventually at Stormont, you wonder what's keeping them in place. Traditional politicians seem to be regarded with increasing contempt and there's a sense that they may become irrelevant. Or maybe that's a hope. the city is amazingly small. I had no idea the Falls and the Shankhill are barely a block apart. The way they mirror each other almost exactly, in terms of murals, memorials, insignia and flags, is weirdly Disneyesque. Who does those murals?